This is a hand signed Chemical Bank check by Eddie Rickenbacker and is dated from August 11, 1970. It is beautifully kept and with a photo of Rickenbacker in a plane. It is over 43 years old. Edward Rickenbacher was born in Columbus, Ohio, to German-speaking Swiss immigrants. During World War I with its anti-German atmosphere, he, like so many other German-Americans, changed his surname -- the "h" in "Rickenbacher" became a "k" in an effort to "take the Hun out of his name." As he was already well known at the time, the change received wide publicity. "From then on", as he wrote in his autobiography, "most Rickenbachers were practically forced to spell their name in the way I had..." He started using the name "Vernon" as a middle name because he believed his given name "looked a little plain." He was primarily concerned with what his new middle initial would be. After settling upon "V", he selected "Vernon" as a middle initial name. From childhood, Eddie Rickenbacker loved machines and experimented with them, encouraged by his father's words "A machine has to have a purpose". In what was to become one of the defining characteristics of Eddie Rickenbacker's life, Rickenbacker nearly died many times, from an early run-in with a horse-drawn carriage, to a botched surgery, to airplane crashes. His first near-death experience occurred when he was in the "Horsehead Gang". He lived near a mine and they decided to ride a cart down the slope. It tipped over and almost crushed them. Rickenbacker's schooling ended after the death of his father, but, driven by an intense admiration for machines, Rickenbacker taught himself as much as he could, including enrolling in a correspondence course in engineering. He aggressively pursued any chance of involvement with automobiles, and Rickenbacker's time at a Pennsylvania Railroad machine shop led him into the automobile industry. By 1910, Rickenbacker was racing his employer's cars. Touted as the first man to drive a mile a minute, he received the sobriquet "Fast Eddie" (giving rise to a nickname borne by many men named Edward since his time). Eddie Rickenbacker raced in the 1912, 1914, 1915 and 1916 Indianapolis 500. His only finish in the race was in 1914 when he finished 10th. In the other three races, he did not finish due to car failure. Notably, in the 1916 race, he started on the front row in 2nd place. Eddie Rickenbacker wanted to join the Allied troops in World War I, but the U.S. had not committed. He had several chance encounters with aviators, including a fortuitous incident where he repaired a stranded aircraft for T.F. Dodd, a man who would become General "Black Jack" Pershing's aviation officer and an important contact in Rickenbacker's attempt to join air combat. In 1916, Rickenbacker traveled to London, with the aim of developing an English car for American races. Because of press innuendo and Rickenbacker's known Swiss heritage, he was suspected of being a spy. En route and in England, agents closely monitored his actions. Rickenbacker helped organize an advance group of soldiers to be ready if the United States joined the war. When, in 1917, the United States declared war on Germany, Rickenbacker had enlisted in the United States Army and was training in France with the very first American troops. Rickenbacker arrived in France on June 26, 1917 as sergeant first-class. Most men chosen for pilot training had degrees from prestigious colleges, and Rickenbacker had to struggle to gain permission to fly because of his perceived lack of qualifications. Because of his prodigious mechanical abilities, Rickenbacker obtained a position as engineering officer in a flight-training facility at Issoudun, where Rickenbacker practiced flying during his free time. He learned to fly well, but because his skills were badly needed at the training facility, Rickenbacker's superiors tried to prevent him from attaining his wings with the other pilots. 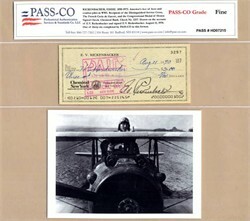 Rickenbacker demonstrated that he had a qualified replacement, and the military awarded Rickenbacker a place in America's second air-combat squadron, the 94th Aero Squadron, informally known as the Hat-in-the-Ring Squadron. He flew rudimentary aircraft, sometimes without weaponry, alongside French pilots. The 94th periodically faced Germany's legendary Flying Circus, led by the Red Baron, Manfred von Richthofen, until von Richthofen's death in combat. On April 29, 1918, Rickenbacker shot down his first plane. During WWI, Rickenbacker and the other pilots developed important aviation principles that would serve them in civil aviation and in WWII combat. Capt. Eddie Rickenbacker, United States Army Air Service, c.1919Respect for him grew as his successes mounted. Rickenbacker was awarded the French Croix de Guerre in May 1918, for shooting down five German airplanes. On September 24, 1918, now a captain, he was named commander of the squadron, and on the following day, he shot down two more German planes, for which he was belatedly awarded the Medal of Honor in 1931 . Rickenbacker's 26 victories constituted an American record that stood until World War II. The military determined ace status by counting the number of aircraft shot down by a pilot, and verifying reports with ground witnesses and the affirmations of other pilots. If no witnesses could be found, a reported kill was not counted. In 1969, the U.S. Air Force released Historical Study 133. This study converted the whole victory credits awarded into fractions, to show which credits were shared and to calculate the number of enemy aircraft actually covered by the credits. This was more in line with the criteria the Americans applied in World War II, but it did not reflect the actual credits awarded. Confusion resulted, because researchers using Historical Study 133 would sometimes add the fractions of flyers to get their aerial victory credit totals. Rickenbacker's official score of 26 still stands, which can be seen at the USAF Historical Research Agency. While the US Air Service credited "out of control" and other nonfatal victories, in terms of aircraft destroyed, Rickenbacker's tally was six airplanes and three balloons in the air, plus two balloons on the ground. (Several other Americans were credited with more enemy aircraft destroyed but fewer victories, including Frank Luke; Raoul Lufbery, who flew with the French; and Frederick Gilette and Harold Kullburg of the RAF.) Nevertheless, Rickenbacker flew a total of 300 combat hours, reportedly more than any other U.S. pilot in the war. The most successful American ace at that time, Rickenbacker was dubbed by the press as America's "Ace of Aces." On 2 October 1918 Rickenbacker and Lt. Reed Chambers brought down a Halberstadt CL- not a Hanover C.III.a - of Schlachstaffel 5. He claimed his 26th and final plane on October 30, 1918, 12 days before the end of the war. When Rickenbacker learned of the Armistice, he flew an airplane above the western front to observe the cease fire and the displays of joy and comradeship as the formerly warring troops crossed the front lines and joined in celebration. After World War I ended, Eddie was approached for publicity exploits. He chose to go on a Liberty bond tour. He was offered many movie positions but did not want all the attention, even though he was the most celebrated aviator in America (soon to be taken by Charles Lindbergh's flight over the Atlantic). Rickenbacker described his WWI flying experiences in his memoirs, Fighting the Flying Circus, published after the war. In this book, he also describes the character, exploits, and death of fellow pilot Lt. Quentin Roosevelt, the son of American President Theodore Roosevelt. Fighting the Flying Circus is now in the public domain, and the text is available online. . In 1925 Rickenbacker was a defense witness, along with Hap Arnold, Tooey Spaatz, Ira Eaker, and Fiorello H. LaGuardia, in the court-martial of General Billy Mitchell. Rickenbacker showed an intense patriotism from childhood. Seeing that his German name appeared to undermine his credibility as a fully American citizen, he changed the spelling of his name from "Richenbacher" to "Rickenbacker" while in France in World War I. He was a convinced Christian all his life, urging honest dealing in both one's business and personal life. Eddie Rickenbacker encouraged and promoted technology and technological innovation and predicted many developments that later occurred, such as the prevalence of air transportation, and the critical role that air warfare and air forces would play in future wars. Many of his ideas that were eventually realized were met with skepticism or outright disbelief when he originally expressed them. Rickenbacker was also adamantly opposed to Franklin Roosevelt's New Deal policies, seeing them as little better than socialism. For this he drew criticism and ire from the press and the Roosevelt Administration, which ordered NBC Radio not to allow him to broadcast opinions critical of FDR's policies after Rickenbacker harshly denounced FDR's use of Air Force pilots to carry Air Mail; the main reason for this denunciation was that several of the pilots had died in crashes while carrying the mail. In 1922, Rickenbacker married Adelaide Frost; their marriage lasted for the rest of his life. Although they spent considerable time in Florida, Texas, and Ohio, the Rickenbackers lived chiefly in New York City. They adopted two sons: David, in 1925 , and William, in 1928. Adelaide was an unconventional wife for the times: she was five years older than her husband, had been previously married, and was outspoken and active. As independent as she was, Adelaide fully supported Rickenbacker's endeavors until his death in 1973. In 1977 at the age of 92, Adelaide being completely blind, in failing health and severely grieving the loss of her husband, shot herself at her home on Key Biscayne, Florida. Still interested in machines, Rickenbacker started an automobile company (see: Rickenbacker), selling technologically advanced cars based on innovations discovered in automobile racing. The Rickenbacker came equipped with the first four-wheel brake system. Probably due to the resistance to this idea propagated by other car manufacturers, which had inventory lacking four-wheel braking systems, Rickenbacker's car company was financially unsuccessful. He went into massive debt, because of company losses, and determined to pay back everything he owed. Eventually, all vehicles manufactured in the U.S. incorporated four-wheel braking. Managing the Indianapolis Motor Speedway In 1927, Rickenbacker bought the Indianapolis Motor Speedway, which he would operate for nearly a decade and a half before closing it down due to World War II. Rickenbacker oversaw many improvements of the facility, such as banking the curves to enable better and safer turning. In 1945, Rickenbacker sold the Speedway to Terre Haute, Indiana businessman Anton Hulman, Jr..
Once the Speedway operations were under control, Rickenbacker looked for additional opportunities for entrepreneurship, including sales for the Cadillac division of General Motors and various aircraft manufacturers and airlines. Rickenbacker's most lasting business endeavor was his lifelong leadership of Eastern Air Lines. With the help of friends he had met in the war, or in car racing, or in other walks of life, Eddie Rickenbacker combined Eastern Air Transport with Florida Airways to form Eastern Air Lines, an airline that would grow from a company flying a few thousand air miles per week to a major international transportation company. Rickenbacker oversaw many radical changes in the field of commercial aviation. He negotiated with the U.S. government to acquire air mail routes, a great advantage to companies in need of business. He helped develop and support new aircraft designs. Rickenbacker acquired historic aircraft for Eastern, including the Lockheed Constellation commissioned by Howard Hughes for Trans World Airlines (Rickenbacker, 1967, 440). Rickenbacker personally collaborated with many of the pioneers of aviation, including Donald Wills Douglas, Sr., founder of the Douglas Aircraft Company that would become McDonnell Douglas. He helped convince the American public to consider flying; but, always aware of the possibility of accidents, Rickenbacker avoided calling the new method of transportation "safe." In his autobiography, he wrote "I have never liked to use the word "safe" in connection with either Eastern Air Lines or the entire transportation field; I prefer the word "reliable."" (Rickenbacker, 1967, page 261). Rickenbacker often traveled for business on Eastern Airlines flights, and on February 26, 1941, a DC-3 on which he was flying crashed outside Atlanta. Rickenbacker suffered grave injuries, was soaked in fuel, and was immobile and trapped in the wreckage. In spite of his own critical wounds, Rickenbacker encouraged the uninjured passengers, offered what consolation he could to those around him who were injured or dying, and guided the still-mobile survivors to attempt to find help. They were rescued after spending the night at the crash site. Rickenbacker barely survived, and this was the first time the press announced his death while he was still alive. In a dramatic retelling of the incident, Rickenbacker's autobiography relates his astonishing experiences: while still conscious but in terrible pain, Rickenbacker was left behind while ambulances transported bodies of those killed in the accident. When he arrived at a hospital, his injuries appeared so grotesque that doctors left him for dead for some time, instructing staff to "take care of the live ones." (Rickenbacker, 275) Rickenbacker's injuries included a dented skull, other head injuries, shattered left elbow and crushed nerve, paralyzed left hand, several broken ribs, a crushed hip socket, twice-broken pelvis, severed nerve in his left hip, and a broken left knee. Most shocking, his left eyeball was expelled from the socket. (Rickenbacker, 273) He recovered from these after months in the hospital, and regained full eyesight. Rickenbacker describes the experience with vivid accounts of his mentality as he approached death, emphasizing the supreme act of will necessary to stave it off. His autobiography reported that he spent ten days on the brink of death, which he illustrated as an overwhelming sensation of calm and pleasure (Rickenbacker, 1967, 278). For a time, Eastern was the most profitable airline in the post-war era. In the late 1950s, Eastern's fortunes changed, and Rickenbacker was forced out of his CEO position on October 1, 1959. He left his position as chairman of the board December 31, 1963. Rickenbacker supported the war effort as a civilian. In 1942, he toured training bases in the southwestern United States and in England. He encouraged the American public to contribute their time and resources to success in WWII, and pledged Eastern Airlines equipment and personnel for use in military activities. Rickenbacker served the military extensively, inspecting troops, operations, and equipment, and serving in a publicity function to increase support from civilians and soldiers. In 1942, with a sweeping letter of authorization from Henry L. Stimson, U.S. Secretary of War, Rickenbacker visited England on an official war mission and made ground-breaking recommendations for better war operations. One of Rickenbacker's most famous near-death experiences occurred during the service of the United States war effort. In October 1942, Rickenbacker was sent on a tour of the Pacific theater to review conditions, operations, and to personally deliver a secret message to General MacArthur. After visiting bases in Hawaii, the B-17D, 40-3089, in which he was flying went off course hundreds of miles from its first scheduled stop at Canton Island. (The navigation failure was due to an out-of-true octant, which introduced bias in the navigation calculations. The octant had suffered a severe shock in a pre-takeoff incident.) This accident later resulted in improved navigation tools for aircraft, and improved survival gear provided on aircraft. The pilots ditched the plane in the Pacific, dangerously close to Japanese-held enemy territory. For 24 days, Rickenbacker, his friend and business partner, and the crew drifted at sea without food or water aside from an occasional fish and rain. Rickenbacker still suffered from the airline crash, his friend Hans Adamson sustained serious injuries in the water landing, and others in the crew were hurt to varying degrees. The crew's food supply ran out after three days. On Day 8 a seagull landed on Rickenbacker's head. Rickenbacker painstakingly caught it, and the survivors meticulously divided it equally and used some for fishing bait. They lived on sporadic rain water and similar food "miracles." Rickenbacker assumed a role of leadership, encouragement, and browbeating to help the others survive, and encouraged them to turn to the Lord for solace (Psalm 46). According to Rickenbacker, each person on the rafts converted to Christianity after the experience. The U.S. Army Air Forces, unable to find them, intended to abandon the lost crew after searching unsuccessfully for more than two weeks, but Rickenbacker's wife convinced them to extend the search another week. Once again, the press reported that Rickenbacker had died. Navy pilots rescued the surviving members of the crew, suffering from exposure, dehydration, and starvation, on November 13, 1942, off the coast of Island X near Samoa. One serviceman had died and was buried at sea. Rickenbacker completed his assignment and delivered MacArthur's secret message. No one ever made the message public. It should be noted that Rickenbacker initially thought that he had been lost a mere 21 days, and wrote a book about the experience titled "Seven Came Through" published by Doubleday, Doran. It was not until later that he recalculated and corrected the error in his 1967 autobiography. Still determined to support the U.S. war effort, Rickenbacker suggested a fact-finding mission in the Soviet Union to provide the Soviets with needed technical assistance for their American aircraft. His private objective was to gain knowledge about ever-more hostile Soviet military capabilities. Rickenbacker approached Soviet diplomats, and avoided requesting help from President Franklin Roosevelt, alluding to personal disagreements between the two. With the help of the Secretary of War and by trading favors with the Soviet ambassador, Rickenbacker secured unlikely permission to travel to the Soviet Union. The War Department provided everything Rickenbacker needed, including a highly unusual letter stating that the bearer was authorized to "visit ... any ... areas he may deem necessary for such purposes as he will explain to you in person," signed by the Secretary of War (Rickenbacker, 1967, 390). Rickenbacker's trip took him over South America, where he made important observations about conditions there. He stopped in Africa, China, and India, at each stop reviewing American operations and making notes to report to authorities. In Iran, Rickenbacker offered to bring along an American officer, whose unapproved request to travel to the Soviet Union delayed Rickenbacker's party for a few days. In the Soviet Union, Rickenbacker observed wartime conditions, extraordinary dedication and patriotism by the populace, and ruthless denial of goods and services to unproductive members of society. He befriended many Soviet officials, and shared his knowledge of the aircraft they had received from the United States. He was lavishly entertained and recalled attempts by KGB agents and officials to intoxicate him and gain sensitive information. Rickenbacker's mission was successful. He discovered that a commander of Moscow's defense had stayed at Rickenbacker's home in 1937, and personal connections like this and the respect the Soviet military personnel had for Rickenbacker greatly improved Rickenbacker's effectiveness at information-gathering. When he left the Soviet Union, Rickenbacker understood Soviet defense strategies and capabilities, knew about brand-new strategies against advancing tank battalions, and had memorized a map of the Soviet's front line showing standard military location markers for all major units. (Rickenbacker, 1967, 422). He was also provided with unprecedented access to the Shturmovik aircraft factory. But it was comments made by Rickenbacker during his trip that alerted the Soviets to the existence of the secret B-29 Superfortress program. Winston Churchill interviewed Rickenbacker about his mission. In the U.S., Rickenbacker's information resulted in some diplomatic and military action, but President Roosevelt ignored the information and did not meet with Rickenbacker about his groundbreaking visit to the U.S.S.R. (Rickenbacker, 1967, 438). Although his primary residence was in New York City, for many years Eddie had a winter home in Coconut Grove, Florida near Eastern Airlines's facilities at Miami International Airport. In November 1947 a four mile causeway was completed linking Miami on the mainland of Florida with Crandon Park on the island of Key Biscayne. The road was named Rickenbacker Causeway in honor of the aviation pioneer and president of Eastern Airlines. In the 1960s, Rickenbacker became a well-known speaker. He shared his vision for the future of technology and commerce, exhorted Americans to respect the enemy (the Soviet Union) during the Cold War, yet uphold American values, and endorsed conservative ideals. After retiring from Eastern Air Lines in 1963 at the age of 73, Adelaide and Eddie Rickenbacker traveled extensively, until Eddie Rickenbacker had a stroke while in Switzerland seeking medical treatment for Adelaide there. He died on July 23,1973 in Z�rich, Switzerland, and his body was buried in Columbus, Ohio, at Green Lawn Cemetery. In 1974 , the Lockbourne Air Force Base in his home town of Columbus was renamed Rickenbacker Air Force Base. For over twenty years there has been a casual restaurant chain honoring Rickenbacker's squadron, the 94th Aero Squadron. Generally located near airports, locations look like French farmhouses with World War I airplanes and sandbagged gun emplacements around it. On the inside it is filled with military aviation memorabilia. Customers can put on headphones and listen in to the pilots conversing with the flight controllers. Eddie Rickenbacker's military awards, badges, and insignia on display at the San Diego Aerospace MuseumHe was inducted into the International Motorsports Hall of Fame in 1992. He was inducted into the National Sprint Car Hall of Fame in 1992. Rickenbacker was inducted into the Motorsports Hall of Fame of America in 1994. Trivia He was a cousin of Adolph Rickenbacker, co-founder of Rickenbacker Guitars. The last name was purposely chosen for its recognition factor as associated with Eddie Rickenbacker. Eddie Rickenbacker appears in the famous PC game Red Baron as one of WWI Allied Flying Aces. In the 1999 computer game System Shock 2 a military spaceship is named the UNN Rickenbacker. In his comic strip Li'l Abner, Al Capp included an airplane pilot modeled on Rickenbacker: Cap'n Eddie Ricketyback. During WWI he tried to convince U.S. military officials to let him form a squadron composed entirely of former race car drivers, on the theory that such men, accustomed to tight spaces and high speeds, would make excellent fighter pilots. His request was denied. The game Wings of War: Famous Aces features Rickenbacker's Spad XIII.